Susette Kelo dreamed of owning a home that looked out over the water. She purchased and lovingly restored her little pink house where the Thames River meets the Long Island Sound in 1997, and had enjoyed the great view from its windows. The Dery family, up the street from Susette, had lived in Fort Trumbull since 1895; Matt Dery and his family lived next door to his mother and father. Matt’s mother was born in her house in 1918 and had never lived anywhere else. The richness and vibrancy of this neighborhood reflected the American ideal of community and the dream of homeownership. Tragically, the City of New London turned that dream into a nightmare. In 1998, pharmaceutical giant Pfizer built a plant next to Fort Trumbull and the City determined that someone else could make better use of the land than the Fort Trumbull residents. The City handed over its power of eminent domain—the ability to take private property for public use—to the New London Development Corporation (NLDC), a private body, to take the entire neighborhood for private development. As the Fort Trumbull neighbors found out, when private entities wield government’s awesome power of eminent domain and can justify taking property with the nebulous claim of “economic development,” all homeowners are in trouble. The fight over Fort Trumbull eventually reached the U.S. Supreme Court, where the Court in 2005, in one of the most controversial rulings in its history, held that economic development was a “public use” under the Fifth Amendment to the U.S. Constitution. The Supreme Court’s 5-4 decision against Kelo and her neighbors sparked a nation-wide backlash against eminent domain abuse, leading eight state supreme courts and 43 state legislatures to strengthen protections for property rights. Moreover, Kelo educated the public about eminent domain abuse, and polls consistently show that Americans are overwhelmingly opposed to Kelo and support efforts to change the law to better protect home and small business owners. Moreover, since the Kelo ruling in June 2005, citizen activists have defeated 44 projects that sought to abuse eminent domain for private development. Meanwhile, in New London, the Fort Trumbull project has been a dismal failure. After spending close to $80 million in taxpayer money, there has been no new construction whatsoever and the neighborhood is now a barren field. In 2009, Pfizer, the lynchpin of the disastrous economic development plan, announced that it was leaving New London for good, just as its tax breaks are set to expire. But Susette Kelo’s iconic little pink house was saved and moved to a new location. You can visit the historic Kelo House, which is now the home of local preservationist Avner Gregory, at its new location in downtown New London: 36 Franklin Street (at the intersection of Franklin and Cottage Streets). For a compelling account of the history and back-story of the New London controversy, read Jeff Benedict’s book Little Pink House: A True Story of Defiance and Courage published in 2009 by Grand Central Publishing. The book was also adapted into an award-winning feature film Little Pink House, which debuted in 2018, starring Catherine Keener as Susette Kelo, and is available to stream online. Amicus Brief by NAACP, AARP, et al. Amicus Brief by American Farm Bureau Federation, et al. Amicus Brief by Cascade Policy Institute, et al. Amicus Brief by Develop Don’t Destroy (Brooklyn), Inc., et al. Amicus Brief by Goldwater Institute, et al. Amicus Brief by Mountain States Legal Foundation, et al. Amicus Brief by New London R.R. Co., Inc. The End of an Eminent Domain Error: Pfizer R&D Headquarters Closes in New London, Conn. When Susette Kelo purchased her two-bedroom, pink house in 1997 along the Thames River—a beautiful stretch of waterfront property in New London, Conn.—she thought she had her work cut out for her just restoring the house and designing the garden. That turned out to be the least of her worries. Unbeknownst to Susette, the City, the New London Development Corporation (a private development corporation) and Pfizer Corporation had reached an agreement. Pfizer would build a new facility nearby. The NLDC would take all the land in Susette’s neighborhood and transfer it to a private developer who would in turn build an expensive hotel for Pfizer visitors, expensive condos for Pfizer employees, an office building for biotech companies, and other projects to complement the Pfizer facility. The State and the City would contribute millions of dollars. The only thing standing in the way was Susette and her neighbors. In the face of such statistics, the Institute for Justice, a Washington, D.C., public interest law firm, has waged a national campaign in court and in the court of public opinion to restrain government’s abuse of eminent domain and to restore constitutional protection for private property. The Supreme Court needs to address this radical departure from the language of the Constitution. Its last case involving private development was 50 years ago, and it allowed the clearance of an area so blighted that most buildings lacked plumbing. For the last 50 years, without further guidance, it’s been up to states to set their own rules. Not surprisingly, the states have reached conflicting conclusions. Some states, like Connecticut, allow condemnations for “economic development.” Other states, like Washington, South Carolina and Maine, do not. The Constitution is supposed to apply to all United States citizens, and U.S. Supreme Court guidance is desperately needed to prevent the continuing and growing abuse of eminent domain. In early 1998, pharmaceutical giant Pfizer announced that it would build a $270 million research facility in New London. 2 Pfizer bought the land along the Thames River from the State for $10 million. The company and other development groups associated with the project are slated to receive at least $118.2 million in federal and state subsidies over 13 years. The Pfizer plant, which was completed in 2001, bordered a well-established neighborhood called Fort Trumbull. (Bordered—in the past tense—because most of the neighborhood has been bulldozed under the threat of eminent domain. Only a few individuals, those who are holding on to vindicate their property rights, remain.) The neighborhood is also along a scenic stretch of waterfront property connected to Fort Trumbull State Park. In January 2000, the New London City Council approved a Municipal Development Plan for the 90-acre Fort Trumbull neighborhood. The intent of the City of New London is to acquire all the remaining properties through eminent domain to build a hotel, private office space, high-income private housing, and other unspecified development projects that will enhance the Pfizer plant. But the New London City Council authorized the NLDC to use eminent domain to force Fort Trumbull residents to give up their homes and businesses. The NLDC remains unapologetic about the use of eminent domain to accomplish its redevelopment plan. As former NLDC President Claire Gaudiani, who initiated the destruction of the Fort Trumbull neighborhood, said in a speech to higher education and civic leaders justifying the NLDC’s actions in Fort Trumbull, “Anything that’s working in our great nation is working because somebody left skin on the sidewalk.”5 Thus, according to Gaudiani, the home and business owners must be sacrificed for the supposed “greater good” of the community. A notable exception to the NLDC’s plan to clear-cut the neighborhood is the Italian Dramatic Club, a politically connected “social club” of Connecticut’s political establishment, which is located in the very same neighborhood as all the homes targeted for destruction. Among the Italian Dramatic Club’s patrons was former Connecticut Gov. John Rowland, who helped direct much of the State funding for the NLDC’s work in New London and who resigned in June 2004 amid an ethics scandal. The club was informed in September 2000 that it could remain in the neighborhood.6 The un-elected NLDC decision to preserve the politically powerful Italian Dramatic Club while demanding that New Londoners move out led Fort Trumbull homeowner Matt Dery to quip that the NLDC’s actions in his neighborhood have been both shameful and shameless. Under extreme pressure from the NLDC—which included posting eviction notices on the day before Thanksgiving in 2000 on the doors of residents who refused to move—the Fort Trumbull neighborhood certainly has been transformed. Once obtaining properties of those who wanted to sell as well as others who felt like they had no choice but to surrender their homes or businesses, the NLDC moved swiftly and demolished the structures. Today, vast empty dirt fields give the neighborhood the feel of a moonscape with the remaining homes and businesses left standing on less than two acres along the edge of the 90-acre parcel of land slated for private development. The vast majority of the NLDC’s development could move forward without taking the few remaining homes, but the NLDC wants it all. In September 2000, the Connecticut Trust for Historic Preservation named the nine-acre Fort Trumbull neighborhood one of the most threatened historic places in Connecticut. 7 And rightfully so. In a neighborhood that once teemed with dozens of families, only seven property owners who own 15 total parcels remain. These individuals do not wish to sell and have refused any offers on the property; they simply want the government and the developer to leave them alone. Despite the NLDC’s threat demanding they move out no later than March 2001, these seven families continue to fight for their property rights. Susette Kelo, a registered nurse, purchased her dream home on East Street in Fort Trumbull in July 1997. From her dining room window on a clear day she can see Montauk Point at the tip of Long Island. When Susette first purchased the cute little Victorian, it was so overgrown with weeds that she literally needed a hatchet to reach the front door. But soon thereafter, the house was lovingly restored into a little pink “show home” for herself and her husband Tim. They were happy there until a notice was posted on their door the day before Thanksgiving in 2000 by the New London Development Corporation. It informed Susette that she and Tim would have to leave their home by March 2001 or the police would forcibly remove them and their belongings. Less than two years later, Tim drove his truck into a concrete embankment while driving home from work and was nearly killed. Tim relearned to walk and to talk, but as a result of the accident, her husband is now like a child whom Susette must care for as she works two nursing jobs all the while fighting to save her home from the abuse of eminent domain. The Fort Trumbull neighborhood was once largely made up of Italian immigrants. In fact, right up the street from Susette is the Dery family, who has lived in Fort Trumbull since 1895. Matt Dery, his wife Suzanne and their son live right next door to Matt’s mother and father. Matt’s great-grandmother, Maria Ballestrini, purchased that house in 1901. Matt’s mother, Wilhelmina, was born in the house in 1918. She and her husband, Charles, have lived there together since he finished his service in the Merchant Marines in WW II. The Derys liked the neighborhood so much that they bought two more houses and now rent them out. In Connecticut, once a government body claims a property through eminent domain, the title of that property automatically shifts to the condemning authority. Typically, all rents and profits from businesses such as those owned by the Fort Trumbull residents immediately go to the government, or in this case the New London Development Corporation. Even individuals who own their own homes outright are expected to pay “rent” to the government or the development corporation. (But for an agreement negotiated through the court by the Institute for Justice, this would have been the case for Fort Trumbull homeowners. Around the corner from the Derys is Bill Von Winkle’s Fort Trumbull Deli with six apartments above, two homes with another five apartments, and one commercial building with three storefronts once leased out by Bill and his wife, Jennifer. The deli served oversized hoagies to eager customers from 1986 until 2001 when the NLDC’s actions forced the Von Winkles to shut it down and forgo its income. Down the street from Bill Von Winkle’s deli, Jim Guretsky, his wife, Laura, and two young daughters own a triplex property. They lived together in one home and rented out the other two attached to theirs, but because of the dust and hazardous material like lead and asbestos in the air from the destruction of older homes in the neighborhood around them, Jim and his wife decided it would be best for their daughters’ health if they moved to Pennsylvania until things settled back down. A block from the Guretskys are two houses owned by Richard Beyer, who saw promise in the neighborhood and bought the properties back in 1994 to spruce up and rent out. Richard and his business partner poured thousands of hours of sweat equity into renovating the two homes and the lots they purchased. Dumpsters full of trash were removed. They hand-laid 15,000 bricks between the homes to form a parking area. Granite and other stone was hand cut to create countertops and other touches. Next door to one of Richard Beyer’s homes, you encounter the Cristofaro family home. Behind the Cristofaros’ home, you’ll find Byron Athenian’s home. Byron used to be employed at a small auto body shop right next door to his home until the owner sold out to the NLDC and it was demolished in 2002. Even with all the NLDC’s destruction, to Susette and her neighbors Fort Trumbull remains the place they want to call home. But if the City of New London gets its way, she and all of her neighbors will be forced to leave. Eminent domain is the power of government to take away a person’s home or business. It has rightly been called a “despotic” power of government. Because of the vast potential for abuse of such a serious and drastic power, the words of the Connecticut and U.S. constitutions state clearly that private property shall not be “taken for public use without just compensation.” 8 This constitutional provision imposes two important limits on the taking of private property: first, that the use must be public, and second, that just compensation must be paid. If private property could be taken for any use at all, the term “public” would not have been included. Originally, “public use” was understood by everyone—courts, local governments and the general citizenry—to have its ordinary meaning, and eminent domain was used only for projects that would be owned by and open to the public, such as roads or public buildings. Courts further explained that government was limited to taking only that property “necessary” for the public use. It could not simply grab additional land to increase its holdings. The “public use” restriction in the takings clause of the U.S. Constitution fundamentally changed with the U.S. Supreme Court’s 1954 decision in Berman v. Parker. 9 The case upheld the constitutionality of “urban renewal”—misguided efforts by the federal government and local officials to revitalize urban areas to supposedly remove slums and eliminate blight. The case arose in Southwest Washington, D.C., in a poor area populated largely by minorities. Congress granted the District government the ability to acquire tracts of land through eminent domain for the purpose of redevelopment, including the resale of the land to private developers. A department store owner objected to his land being taken and given to another private party. In this one decision, the Court transformed the words “public use” to mean “public purpose” as defined by a legislature or administrative agency. Although the circumstances in Berman were extreme—the area lacked plumbing and had the highest infant mortality rate in the District of Columbia—the decision had much broader legal implications. Many state courts followed the U.S. Supreme Court’s lead and started to uphold virtually any use of eminent domain, even for private parties. What was once a largely well-meaning exception to the Constitution’s public use requirement born in a time of concern about urban decline became a means for governments to take property from one private owner to transfer to another private party for their financial gain. Two things happened in the wake of Berman. First, the definition of blight was expanded dramatically. For many cities, blight is now no longer a run-down slum but merely an area that the government has determined is “functionally” or “economically obsolete.” Cities—like Lakewood, Ohio, for instance—declare neighborhoods blighted on the basis of criteria like the lack of a two-car attached garage, no central air conditioning, and less than two full bathrooms. The Michigan Supreme Court also decided another important eminent domain case, although one that has received less attention. In Detroit Wayne County Stadium Authority v. Alibri, the Stadium Authority told Frida Alibri it would condemn her property if she didn’t sell “voluntarily.” It promised, among other things, that it would not be given to a private party. After the sale, it was indeed transferred to a private corporation. At that point, Alibri sought to get her property back, because the Stadium Authority didn’t have the power to condemn for that purpose, and it had told her that the purpose was not transfer to a private party. The trial court agreed with Alibri; the appellate court, however, agreed with the Stadium Authority. The Michigan Supreme Court returned the property to its rightful owner—Mrs. Alibri. The Court decided Berman v. Parker in 1954. It has not looked at a development case since then. Meanwhile, public use became public purpose, which then became public benefit. What we are left with today amounts to government by the highest bidder—where government force advances the interests of the financially powerful rather than protecting the rights of citizens. Condemnations for private parties now occur throughout the United States, with new condemnations happening all the time. In June 2004, an Ohio court ruled the City of Norwood could use eminent domain to take homes and businesses so Cincinnati-based developer Jeffrey Anderson, who has $500,000,000 in assets, could create a new development on their property even though the court determined that the neighborhood was not blighted. 13 In 2003, the Kansas State Supreme Court upheld the taking of private property for the construction of a distribution center for the retail giant Target. 14 Similar projects involving the displacement of hundreds and in some cases thousands of residents are deep in the development phases in Long Branch, N.J.; Riviera Beach, Fla.; Brooklyn, N.Y.; and Philadelphia. The Kelo v. New London case puts the issue to the U.S. Supreme Court in the clearest possible terms: Does the U.S. Constitution allow the government to take property from one private party in order to give it to another private party because the new owner might produce more profit from the land? The rights of all home and business owners hang in the balance. In March 2004, Lakewood, Ohio, voters repealed the “blight” label from the city’s vibrant and well-kept West End neighborhood. 15 As long as the label was in place, the City could have used eminent domain to tear down the neighborhood for a private developer, and it had in fact threatened to do so. In April 2002, the State of Mississippi, which had sought to take the homes and 24 acres of land owned by the Archie family to give to Nissan Motor Co. to build a manufacturing plant, capitulated. The State announced that Nissan would redesign its manufacturing facility so that the Archie family could hold on to their land and homes, and the State dropped its eminent domain lawsuit against the family. In October 2000, the Institute also filed a lawsuit in federal district court in New York challenging New York’s unconstitutional eminent domain procedures and asking for an injunction to prevent the condemnations of business properties and a church. The case is ongoing. The Institute for Justice is committed to litigation that will restore judicial protection of private property rights—the basic right of every American to responsibly use and enjoy his or her property. On December 20, 2000, the Institute for Justice filed a lawsuit in Superior Court in New London, Conn., challenging the City of New London and the New London Development Corporation’s unconstitutional and illegal eminent domain proceedings on behalf of seven property owners in the Fort Trumbull neighborhood. The lawsuit asked the court to declare the City’s and the NLDC’s actions in these matters unconstitutional and unlawful. The defendants in the lawsuit are the City of New London, the New London Development Corporation, and the New London Development Agency. On March 13, 2002, the Superior Court of New London ruled in favor of four of the property owners in the case. Both sides appealed. 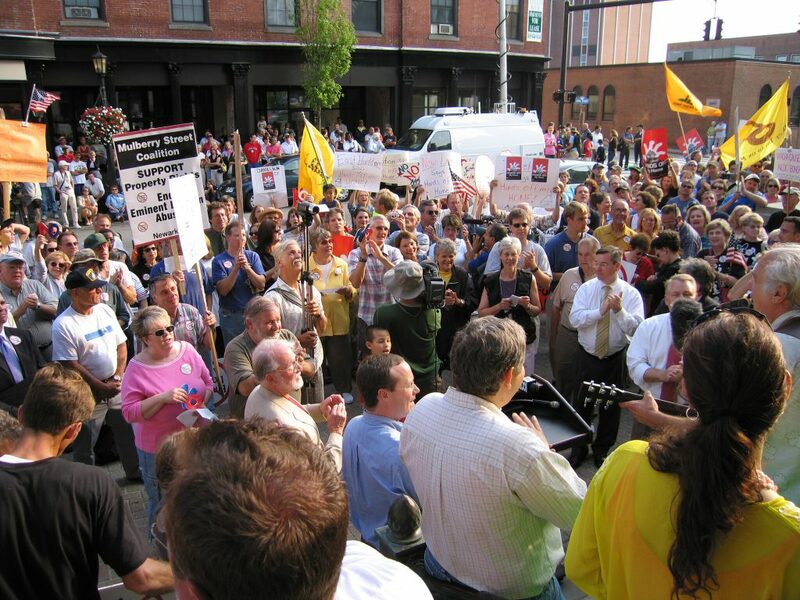 On March 3, 2004, the Connecticut Supreme Court ruled against the property owners by a 4-3 vote, holding that so long as a government body declared it was in financial hardship and that a private development company promised its plan would deliver jobs and taxes, the private-to-private takings were constitutional. 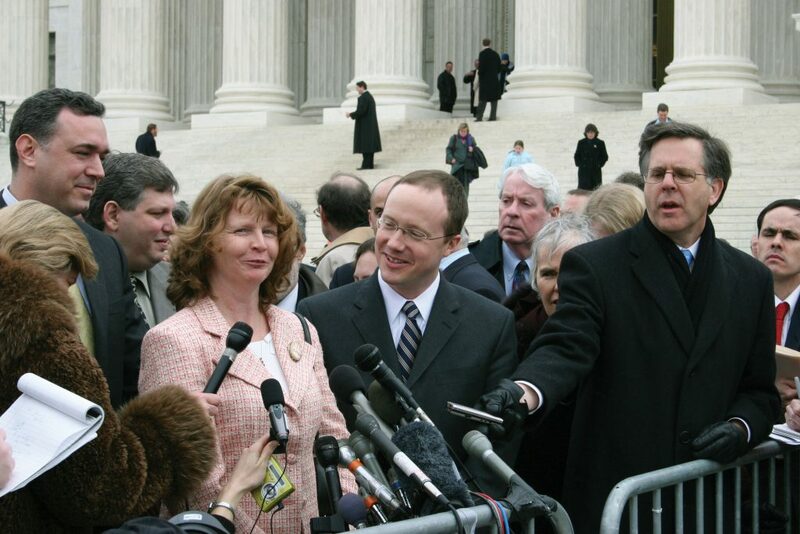 On April 20, 2004, the Connecticut Supreme Court declined to reconsider its ruling; it did, however, issue a stay pending appeal to the U.S. Supreme Court. 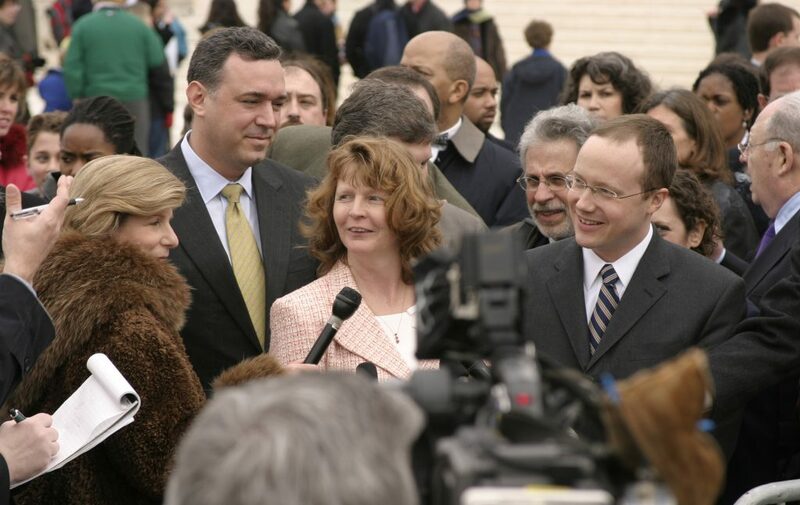 The Institute for Justice will file a petition for certiorari to the U.S. Supreme Court on behalf of the New London property owners on July 19, 2004. Without accountability or constitutional constraints, all the incentives promote aggressive, unbridled use of the eminent domain power, regardless of the impact on innocent property owners. It is time to shift the balance away from government power and back to its citizens. The Institute’s case on behalf of Fort Trumbull property owners seeks to end another sad chapter in the government’s modern-day abuse of its awesome eminent domain power. Americans should not be forced to beg for their rights. 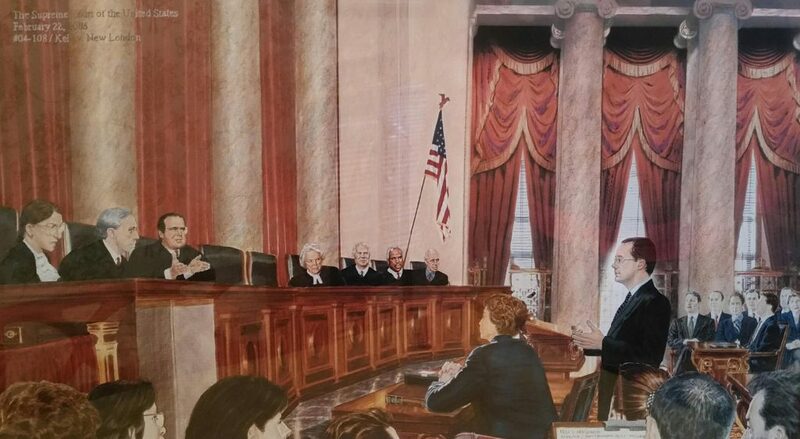 The case of Kelo v. The City of New London reminds the public that property rights are the foundation of all our rights, they are constitutionally enshrined and they must be preserved; when property rights are lost, the loss of other rights will inevitably follow. The Institute for Justice is a Washington, D.C.-based public interest law firm, which through strategic litigation, training and outreach, advances a rule of law under which individuals control their own destinies as free and responsible members of society. It litigates to secure economic liberty, school choice, private property rights, freedom of speech and other vital individual liberties, and to restore constitutional limits on the power of government. In addition, it trains law students, lawyers and policy activists in the tactics of public interest litigation to advance individual rights.